Wow what a day!!! As a group we saw many places and did many things but I am only going to mention the highlights. The National Mosque of Kula Lampur was one of the biggest in the world. I absolutely loved it and admired its beauty. The greatest part of it was about 99% of all North American college students have never been to such a place. We all dressed appropriately and had to wear purple garments as you see in the picture. The palace of Kuala Lampur was also beautiful and the guards were very nice standing in front letting us take their pictures. 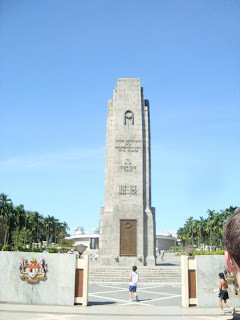 The War memorial was very spectacular showcasing the Malaysian Flag. Singapore city tour & more!